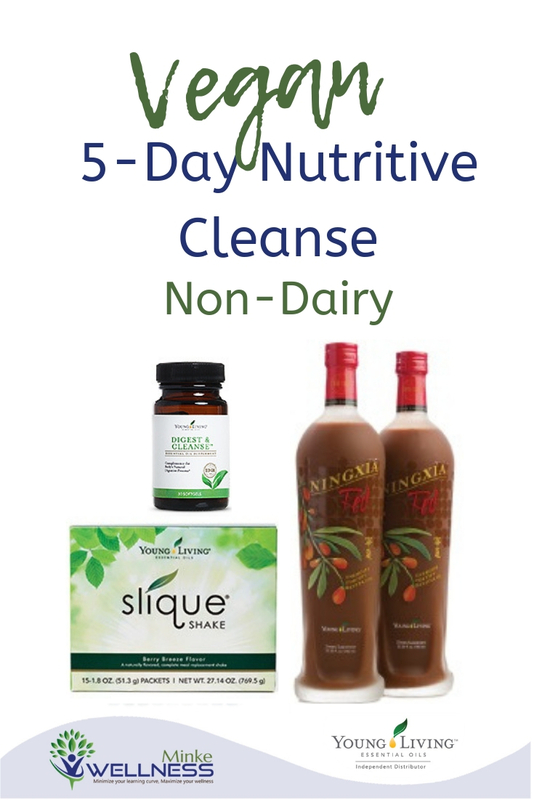 Have you heard great things about the 5-Day Nutritive Cleanse, designed by Young Living Essential Oils, but can’t do the protocol because it has dairy in it? Well, you have options! Here’s the protocol I developed — the recipes and the reasons behind it, so you can troubleshoot to fit your needs. First, here’s my blog post on the 5-Day Nutritive Cleanse, as designed. Most of the info is still relevant and helpful. The Balance Complete is the part of the protocol that contains dairy since it has whey protein. I’ll just note that Peter and I both can get overloaded with dairy fairly quickly, and 3 shakes per day would typically be problematic for us. However, the quality of the whey protein is phenomenal. It digests quickly and feels light in both the digestive and lymphatic systems. 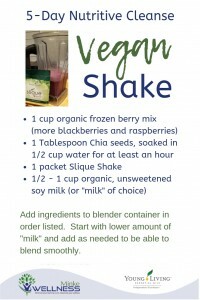 If you are vegan or allergic to dairy, you can skip the Balance Complete with no worries and just substitute the Slique Shake from Young Living. The Slique Shake provides an excellent substitute for the NUTRITIVE part of the cleanse, and you’ll need to add more fiber. Balance Complete has 11 grams of fiber per serving while Slique Shake has 7 grams. I feel very full when I drink a Slique Shake. So, the thought of 3 shakes per day seemed like too much. I decided to do 2 shakes per day and fill in with raw and high fiber snacks as needed. With 3 Balance Complete shakes, I would get 33 grams of fiber per day. With 2 Slique Shakes, I would get 14 grams of fiber per day. So, I needed to add an extra 19 grams of fiber per day — I rounded up to at least 10 grams of fiber per shake. I went with berries because they have a lower glycemic index (or blood sugar effect) than most fruits — I could also get them easily at the grocery store frozen. I liked adding seeds since they’re lower in glycemic index and add some protein and fat. I experimented with the JuvaPower powder. 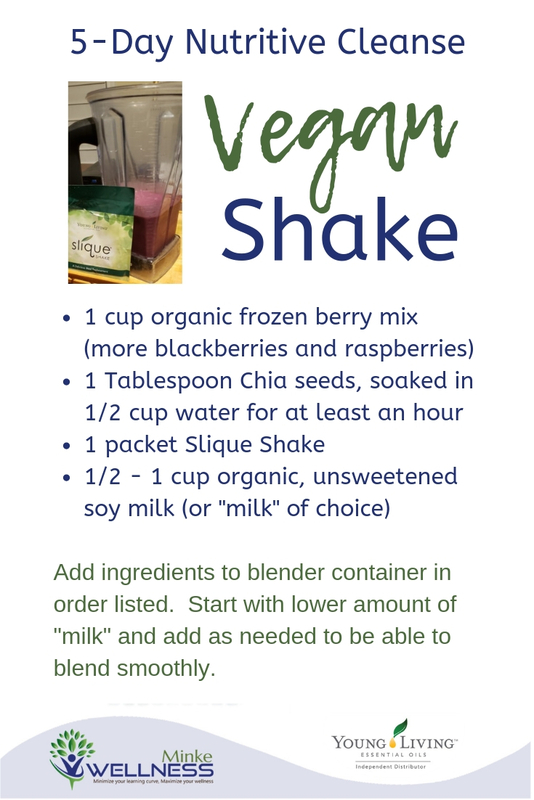 It was helpful in adding to the cleansing effect of the protocol, but it affected the taste of my shake (negatively), so I decided to just take it in smaller amounts (1 teaspoon) by itself once per day. This recipe made a yummy shake that was very filling. I estimated that each shake had at least 17 grams of fiber, not including the “milk” of choice (which would make a total of 34 grams of fiber for the 2 shakes). Add ingredients to blender container in order listed. Start with lower amount of “milk” and add as needed to be able to blend smoothly. The NingXia Red shots were my snacks in between the shakes. Because of the timing, I ended up needing a more substantial snack in between. The Slique bars worked well. Another snack that worked well was carrots and hummus. My goal was to create a protocol that felt similar in my body to the standard 5-Day Nutritive Cleanse protocol. Each time I’ve done that cleanse, there’s a particular sensation of how the essential oil from the capsule feels in my body — not just my digestive system, but up through my torso and into my head — that I interpret as facilitating the cleanse. With this vegan shake and essential oil capsule combo, I experienced a similar sensation. I also got a good cleanse from the vegan version. Yay! 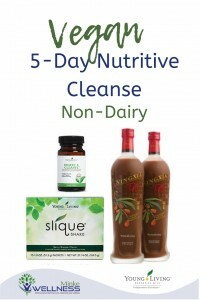 Want some community support while doing the 5-Day Nutritive Cleanse? Join our exclusive Facebook group, YL Wellness Program. You can join us for the cleanse on April 24-28, 2019! And, you’ll have access to other exclusive classes archived in the group, including a 3-part “Curious About Cleansing” seminar. 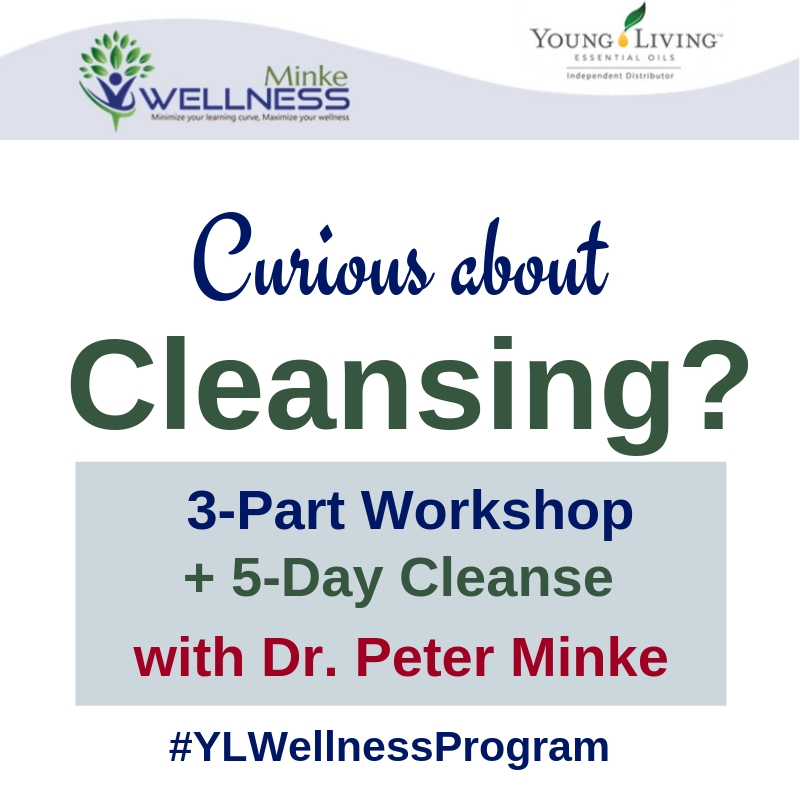 This entry was posted in Cleansing, Food, Recipes, Uncategorized, YL Wellness Program by Peter Minke. Bookmark the permalink.